A pair of great horned owls have occupied the wooded ridge behind my rural home. Since early October, these owls have reminded me each day toward dusk the reason that many people know this large, predatory bird as the “hoot owl.” Low hoots are produced as the two individual owls call and communicate to each other. On many days, this dependable serenade begins a half hour in advance of sunset. Photo by U.S. Fish & Wildlife Service/George Gentry A Great Horned Owl and a fledgling at the nest. I love listening to the sonorous vocalizations of the great horned owl, which ranks as one of the largest owls in the region. It’s not the largest owl in North America, but it is the most widespread of the continent’s large owls. The snowy owl — popularized in J.K. Rowling fiction as Harry Potter’s loyal companion owl — is one of the largest owls in the Northern Hemisphere, bigger than such large owls as great horned owl and barred owl. The aptly named great gray owl is larger in body size than the great horned owl, but the snowy owl is heavier and more massive than either of these two contenders. The Eurasian eagle owl takes the grand prize for size among owls of the Northern Hemisphere. This large relative of the great horned owl has been known to prey on foxes and fawns. A female Eurasian eagle owl can weight almost nine and a half pounds. The great horned owl, in comparison, usually weighs no more than about three and a half pounds. On the other hand, a large female snowy owl may weigh as much as 6.6 pounds. As is often the case with raptors, females are larger than males. Owls, by and large, have been transformed in our time into beloved birds, the stars of viral videos distributed by social media. We no longer think of owls as portents of doom and gloom. While owls still reign supreme once the sun sets and darkness dominates, we no longer fear them. Instead, we’re fascinated by them. As a result, long-standing misunderstandings have fallen by the wayside as we learn more about these incredible birds. Photo by U.S. Fish & Wildlife Service/Susan Rachlin A Great Horned Owl is always alert to its surroundings. The great horned owl lives and hunts in the woodlands of northeast Tennessee, southwest Virginia and western North Carolina. They thrive in rural areas, but these adaptable owls have also learned to make their way in the suburbs and even city parks. Not by any stretch of the imagination, however, is this owl confined to the southern Appalachians. These owls also make their home in the wetlands along the southern Atlantic coast, as well as arid deserts of the American southwest. Photo by Bryan Stevens This great horned owl is part of an educational program at Callaway Gardens in Georgia. Unable to be released back into the wild, this owl helps educate the public on the curious ways of this large feathered predator. While human culture has turned owls into beloved creatures, keep in mind these birds are fierce and ferocious predators. For young American crows in their nests, this owl is the stuff of their avian nightmares. It’s no wonder that crows, which no doubt witness their peers taken by the great horned owl as prey when young and helpless, grow up with an abiding hatred of this large nocturnal raptor. Flocks of adult crows form quickly when an owl is discovered at a roost during the daylight hours. With safety in numbers, the crows mercilessly hound and harry such unlucky owls. Quite often, it does take a crow’s sharp eye to detect a motionless owl at its daytime roost. Great horned owls have a plumage of mottled grays and browns, as well as some white feathers on the chin and throat. This plumage helps them blend into their surroundings. Even when on the move, the great horned owl rarely attracts attention. They can fly in almost perfect silence on their wide wings. 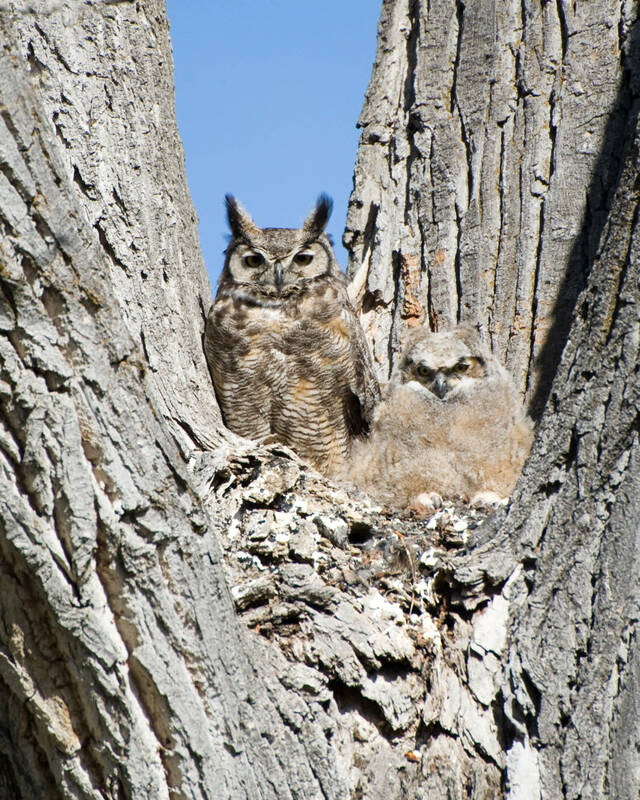 Crows are not the only wildlife with good reason to fear the great horned owl. This predatory bird feeds on the nestlings of other raptors. 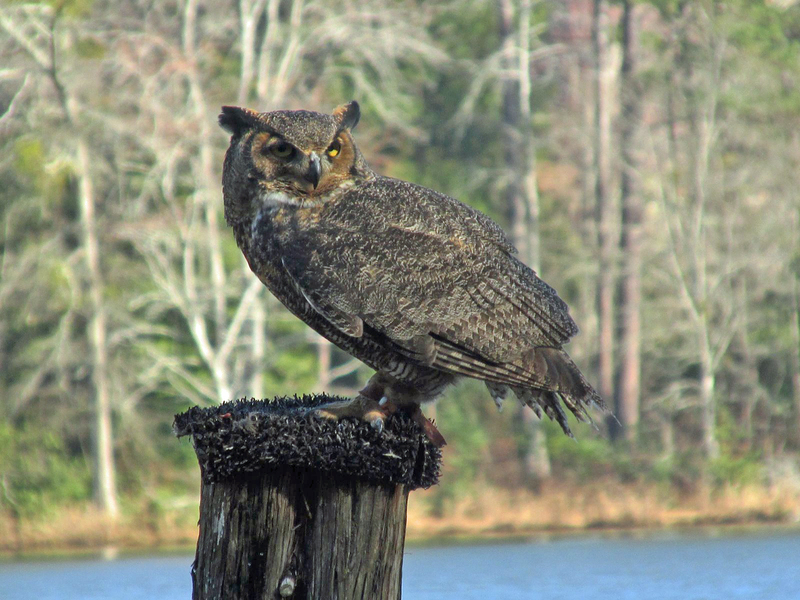 The great horned owl also preys on ducks and other waterfowl, rabbits, other small rodents, as well as some reptiles, amphibians and even bats. • This owl is one of the few predators that preys regularly on skunks. Lacking a well-defined sense of smell, owls aren’t bothered in the least by the skunk’s powerful arsenal of stink. • A wild great horned owl’s longevity peaks at around 13 years of age. Captive owls have been reported reach ages of more than 30 years old. 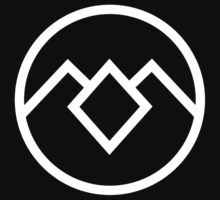 The owl symbol from the 1990s drama, Twin Peaks. • Various Native American tribes have held owls in high respect. Dwight G. Smith, author of Great Horned Owl, a book in the Wild Bird Guides series, noted that members of the Zuni tribe of the southwestern United States often hold owl feathers in their mouths to impart the owl’s ability to hunt silently onto their own hunting abilities. • The David Lynch drama Twin Peaks, which ran originally on ABC from April of 1990 to June of 1991, spent considerable time dwelling on the mystery that “the owls are not what they seem.” Footage of great horned owls provided a sinister, mysterious mood that fascinated viewers. The series is being resurrected in 2017 on Showtime, so fans may finally learn the truth about the owls and their importance to the fictional town of Twin Peaks. 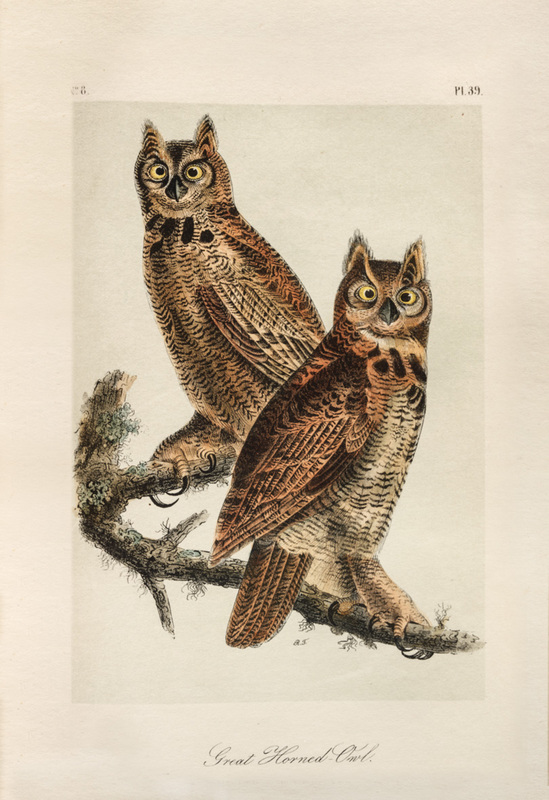 Great Horned Owls painted by early naturalist John James Audubon. There’s nothing to send shivers traveling along your spine like listening to the haunting hoots of a great horned owl hidden from human eyes by the cloak of darkness. It’s no wonder that owls have also become popular motifs for the celebration of the Halloween holiday. Just remember there’s more to these creatures of the night than perhaps meets the eye. 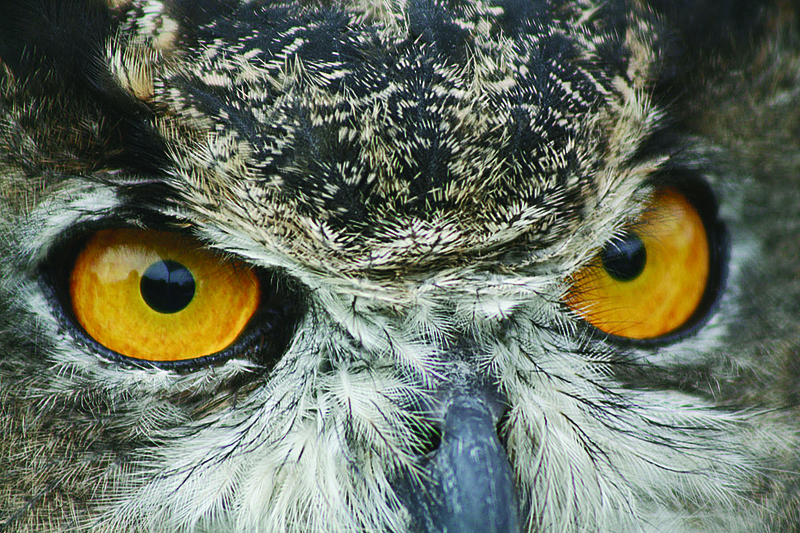 Owls may be our neighbors, but we’ll never truly belong to their world, which must be why they continue to intrigue us. This entry was posted in Birding, Birds, David Lynch, Great Horned Owl, Halloween, The Owls Are Not What They Seem, Twin Peaks and tagged Birding, birds, Bristol Herald Courier, Bryan Stevens, Carter County Compass, David Lynch, Elizabethton Star, Erwin Record, Feathered Friends, McDowell News, Northeast Tennessee, Our Fine Feathered Friends, Owls, The Erwin Record, The Owls Are Not What They Seem, Twin Peaks on October 30, 2016 by Bryan Stevens.